Should you be so lucky as to have a home with ‘downstairs’ and ‘upstairs’, you surely know that the flight of stairs, connecting these two spaces, is not just a bare necessity. The staircase is in fact a key element of both, the residence’s architecture, as well as of its interior design, which means it is expected to be both, functional, but also pleasing the eye. Depending on architectural features and size, modern residences can strongly benefit from a staircase. 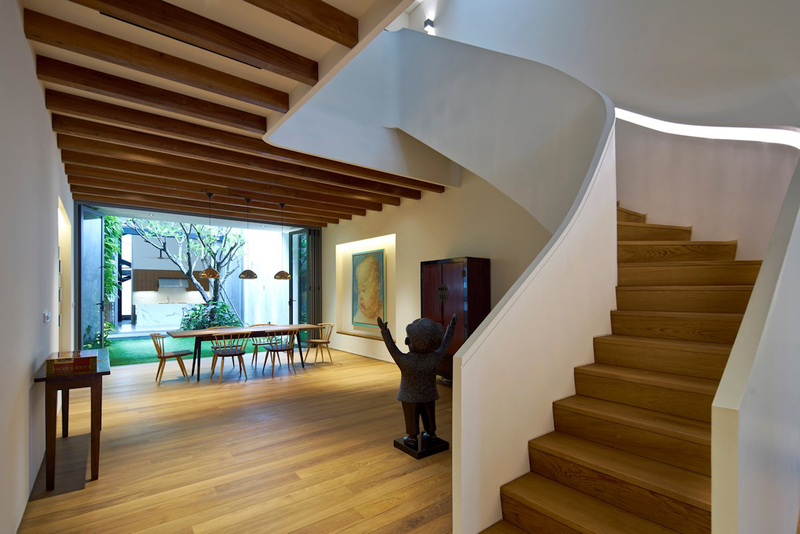 Apart from its obvious purpose, the flight of stairs can also become an attractive focal point of the interior, based on its particular configuration, material, and place. On the other hand, the particular structure and design of the staircase can offer lots of functional opportunities, too, the under stairs storage being one example. Contemporary architecture and interior design styles offer numerous staircase ideas to meet these challenges. From practical to non-conventional futuristic solutions, have a look at some of the best staircase designs and modern trends. Based on form and function, modern staircase designs feature a few trending variants. 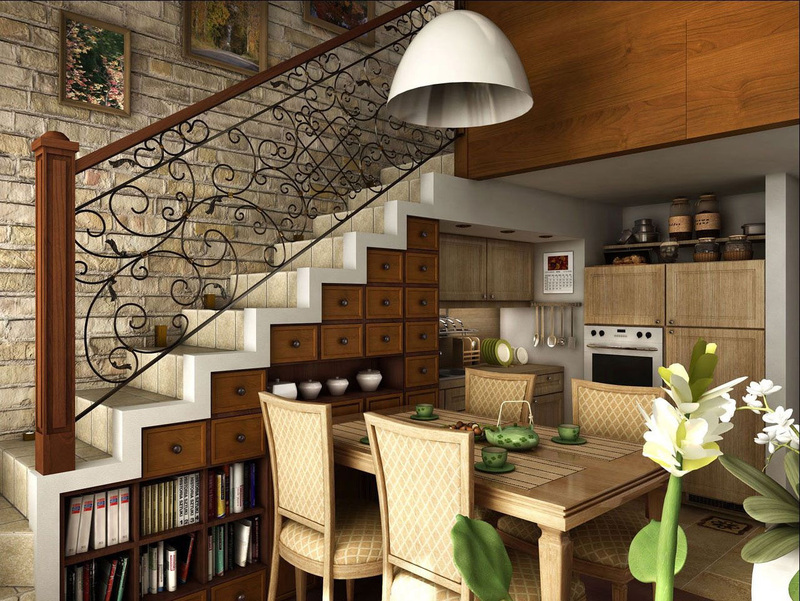 Among these, the spiral staircase is of top popularity, especially in loft and duplex flats. 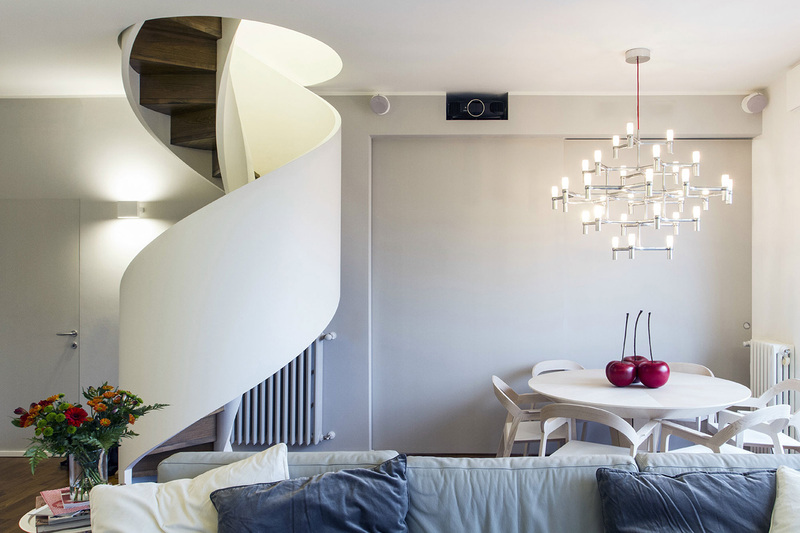 Spiral flight of stairs looks very elegant and adds a particular charm to the interior. From the point of view of interior design, the spiral staircase can be made into a sculptural piece of art in itself, created to satisfy the aesthetical taste of the residents, by offering a variety of design solutions for the central column, the railings and the treads. All in all, the spiral staircase can undoubtedly provide the ‘Wow!’ effect you are looking for. On the other hand, this particular staircase structure can be very practical, too. For one, it occupies a very small space, which makes it possible having it in residences of reduced living area. Two, its shape allows fitting it in various places, be it in a corner, along a wall, or in the very center of the room. Another top choice among the staircase designs is the winding staircase. With its beautifully curved lines, it has always been a magnificent example of architectural and interior design lavishness. This is why winding staircases adorn many large buildings, houses, mansions, castles, and even royal palaces. But this does not mean they have no place in the much smaller in size modern homes! Sure, a winding flight of stairs does need a bit more space when compared to the vertical spiral staircase or the straight-line ladder-type stairs. But it is still a great space saving solution, and provides numerous options for practical use of the space around and under it, too. Another big advantage of the winding staircase is that it is way safer and more stable than other modern staircase structures, which makes it the perfect choice for family homes. From traditional classical beauty, let’s now have a look at some highly unconventional, almost futuristic, staircase designs. Such are the curious and somewhat whimsical floating stairs. 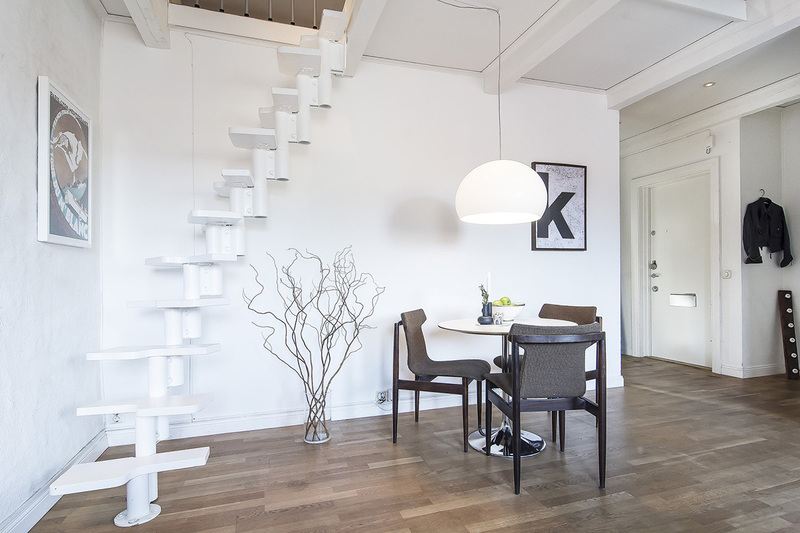 The floating staircase is a great choice for premises designed in minimalist contemporary or futuristic interior styles, as its structure tends to sort of ‘camouflage’ the staircase, providing an optical illusion of emptiness and an effect of greater spaciousness, so characteristic for these particular interiors. 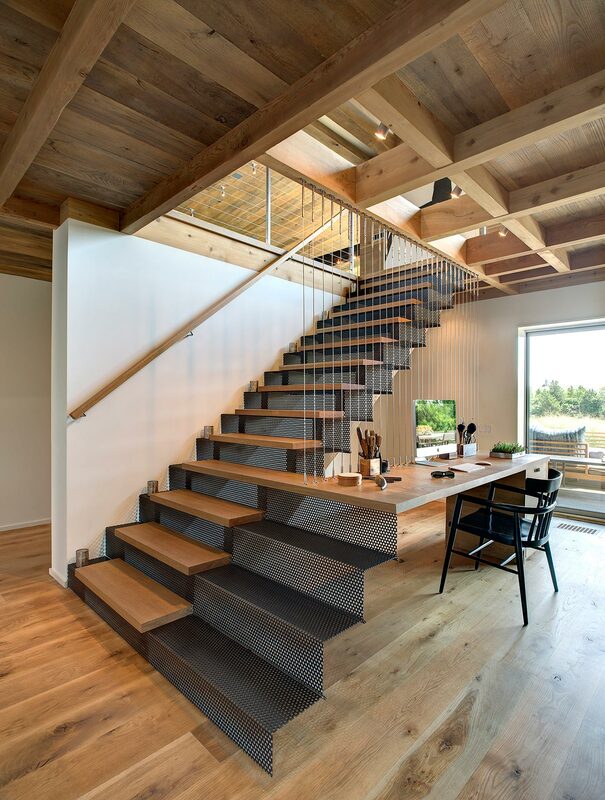 With an open stair plan and alternating treads, often with no railings or visible evidence of any support whatsoever, this staircase looks airy and, as if defying gravity, is rather levitating in the air than providing a solid passage. Definitely a stunning, eye-catching design element of the modern home interior! Most contemporary homes, be it a house or a flat, are space restricted, so every inch counts. And while the staircase is a necessary element, combining house areas, and providing a convenient passage to upper floors, lofts, or attics, their design and structure have become a challenge. The common feature of any space saving staircase is the small footprint and its ability to be fitted in tight-sized premises. The other strong feature of such staircases is the various smart practical solutions for storage and display they offer. Wall galleries of family photos and fine art pieces, wall in-built libraries, or decorative wall linings are some of the most popular options, following such flight of stairs. Spiral staircases provide an excellent opportunity for hanging light fixtures, various decorative pieces, or even flower pots, while winding and floating stairs leave enough space under to be used as storage or to create a quiet relaxing or a small home office nook. 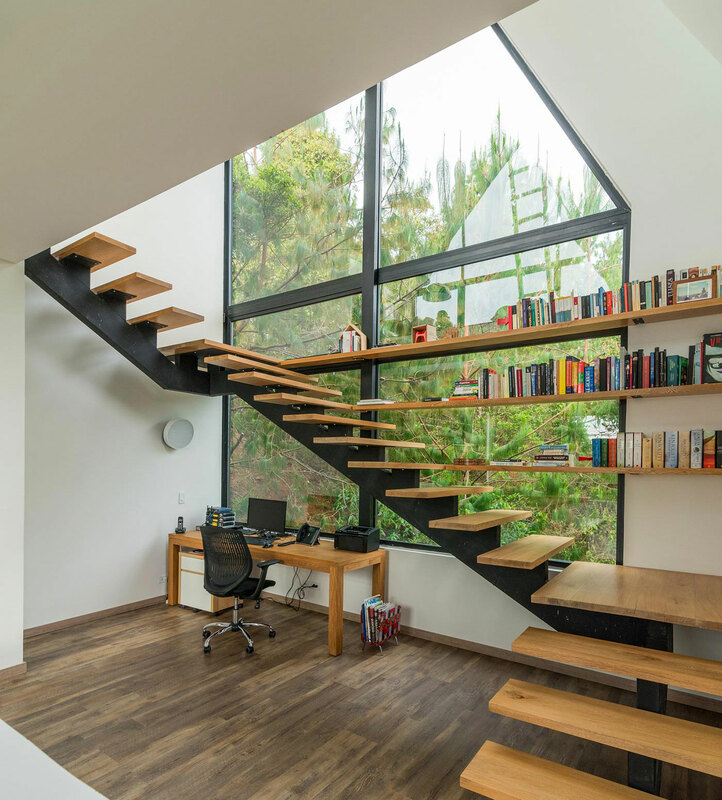 In short, not only these staircases are beautiful in their design, but they are highly practical, too! Whatever the staircase design may be, it is always strongly enhanced by the choice of materials used in the actual structure of this architectural element. And while the classical variants involve mostly solid natural materials, such as wood and stone, the modern designs feature products of the contemporary industries, such as glass, steel, technopolymers, acryl, fiberglass, etc. These are natural materials and as such, they ensure stability, safety and durability. Moreover, these materials have a strong cozy charm to add to the home interior ambiance. Wood has been used in staircases for centuries, and it is no surprise to see it used in our modern times, either. Its popularity as a staircase material is based on the variety of its soft and warm natural colors and tones, as well as on the excellent opportunities it provides for shaping the staircase treads in the desired design and shape. On the other hand, however, complying with the strong eco hype, contemporary industries offer artificial products which successfully match the qualities and the features of natural wood and can be therefore used in staircase structures with great end results as to looks and functionality. Natural stone finds its application mostly in outdoor staircase structures or in indoor staircases built in large, mostly commercial, buildings. Contemporary markets however offer also various substitutes, eco-solutions, and hard material alternatives to natural stone, such as concrete, mosaics, terracotta, fiberglass, etc., to be successfully used in indoor residential staircase projects. Metal is another popular material used in staircase structures and designs. For one, it is strong and ensures stability and safety. Two, it can be shaped, molded and stamped as needed, and moreover it allows various appropriate finishing and rust-protection coatings, as well as being painted in various colors. Finally, it makes a wonderful interior design element, especially in spaces designed in contemporary and industrial styles. Most often, steel is applied in the support and railings / balustrades elements of the staircase structures. Steel staircase treads are also widely used, though for the purpose of safety, these are normally covered with appropriate finishing coats of special anti-slip and grip-safety films or pads. Straight, spiral, winding or flight, glass staircases are perhaps some of the most amazingly beautiful and attractive structures in modern buildings architecture and interior design. To build a safe and functional flight of stairs made of glass is however a huge challenge for both, engineers and producers, as well as for designers. 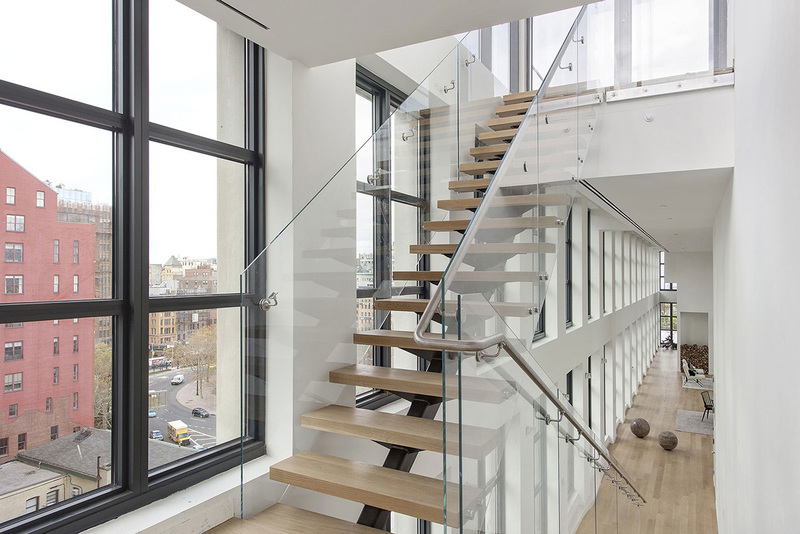 For the purpose, they use a special architectural glass material which is additionally chemically treated, tempered, and laminated, to achieve the desired qualities enabling it to be used in staircase structures. 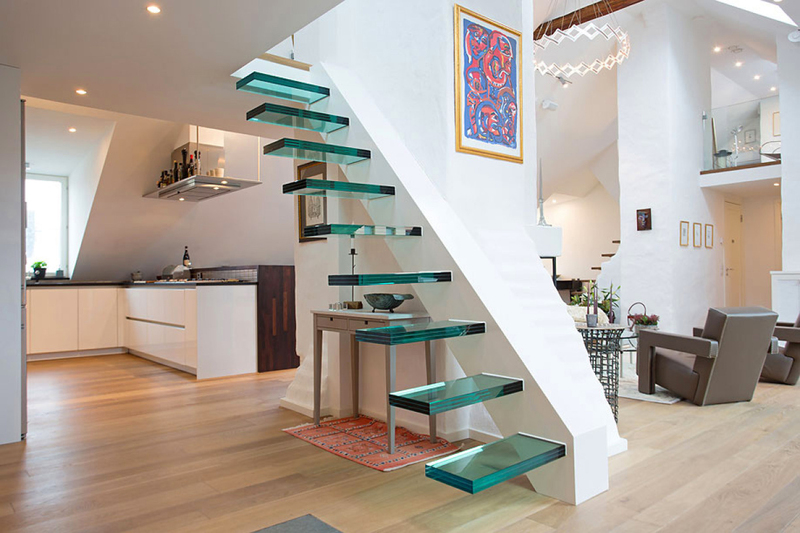 Apart from being applied as a staircase treads material, glass is also widely used for the railings/balustrades structures of various staircase designs, with a stunning result. And let’s not also forget that glass can and is treated into various beautifully toned soft color hues, to meet designers’ and residents’ aesthetical tastes and match overall design color themes. These are products of modern industries achievements, and in qualities and features they rival the traditional materials in almost every aspect. Moreover, they seem to allow even more opportunities in regard to structure and design. Such materials can be made hard and safe enough to endure extensive traffic for a long time. On the other hand, their chemical structures allow them to be used for creating architectural elements in a wide variety of shapes, patterns and colors. They are truly the dream of any modern architect and designer! Technopolymer in particular is a chemical plastic product of exceptional durability, high UV rays resistance, and also allowing coloring directly in the mixture. Until recently it had never been used in staircase structures, but when its qualities proved the ability to meet the corresponding requirements and codes, it found new application opportunities. Today, technopolymer is being successfully used by Fontanot stairs in the production of the Techne Linear spiral staircase modules, rightfully gaining worldwide popularity.